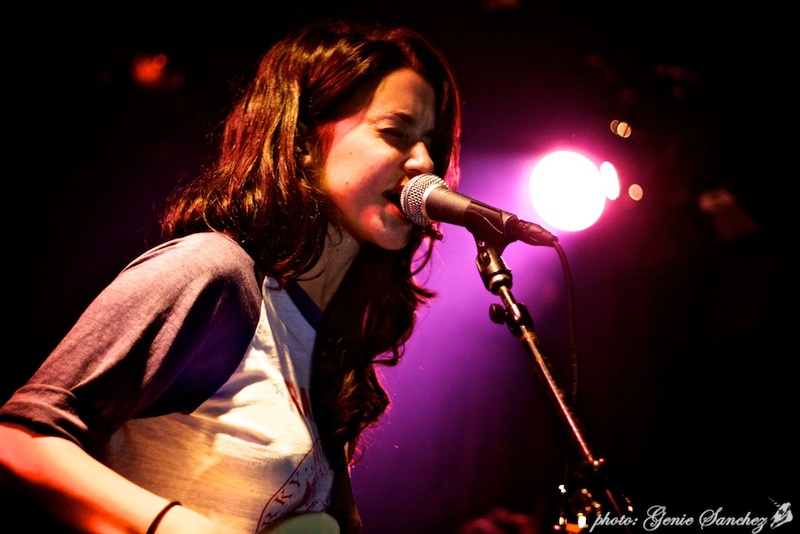 One of the most buzzed about new artists in recent memory, Meg Myers returned to The Viper Room last week for her second sold out showcase. The stormy songstress played to an at-capacity crowd, peppered with major label reps, TV execs and in-the-know tastemakers, all privy to the fact that they were witnessing the turning point of a career. With only a six song EP to mine for her live performances, Myers sailed through a blistering set, leaving the insatiable crowd clamoring for more (yet to be created) new material. Before taking the stage, we were fortunate enough to steal away a few sound bites from Ms. Myers’ as she shared with TSS.com her nervous excitement, at being on the brink of stardom. And how old were you when you started playing music? I started out playing bass and piano… I’d say keyboard first actually, and then kind of started singing around age 12 or 13. Shortly after that, I started playing guitar and writing songs… At 14, I joined a band with my brother… he kind of taught me bass and we just started writing songs and playing shows together. Fourteen years old and playing bars and clubs in Florida [laughter]. Was there an artist in particular (a female artist perhaps), that made you want to pick up the bass? Not at all, I always despised female musicians! I shouldn’t say despised, but I just wasn’t into any… Females that I liked never played bass or weren’t rock musicians. I mean the most female rock I was really into would have been like Heart or Tracy Chapman, or Joan Osborne, and Fleetwood Mac. You know, girls who wrote really good songs… I don’t know, I just never got into rocker chick bass players or anything. As far as inspiration, it always came from guys like Flea and Sting. Sting was a huge inspiration to me, he’s just so amazing! Any new material we’ll get to preview tonight? Yeah, playing a new song tonight called “Make a Shadow.” It’s not completely finished yet. I mean it is, but we still want to add some arrangements later when it’s actually recorded for the new album. Your current EP is sort of all over the map stylistically. In moving forward, is there maybe one song on there that you can point to as the direction that you’re headed musically? That’s a good question because the EP is so crazy. It’s really spread out… I guess I would say the new stuff will be more along the lines of “Monster,” “Curbstomp,” “Adelaide.” A lot of the new songs are more—not that there’s not tons of heart in the EP—but a lot of the new songs are even more like my heart ripping out of my chest. So maybe just a little darker, but in a beautiful way.